In South Texas this is not a good thing. Yesterday I was watering plants near the little house ( a small house in our back yard), when I glanced up and saw them swarmed under the eave of the house. wow, wouldn't this make a great picture for my blog. Luckily sanity returned , and I turned slowly and walked back to the house. It really is serious. There have been deaths in our area due to bee attacks, and our neighbor's son-in-law died after an attack while mowing the grounds at work. I started keeping an Epi-Pen and Benadryl in a desk by our back door , in the event one of us gets stung. After the Bee Man sprayed them (can you believe he just used a spray can? 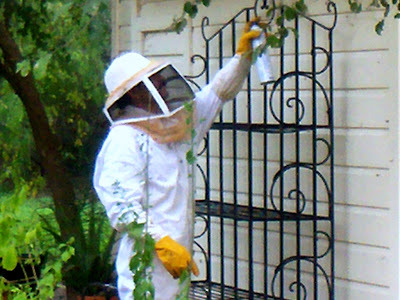 - I hope he was a real Bee Man), he removed the comb to discourage them from returning. He thought I was crazy as I tiptoed outside with my little Kodak EasyShare to get some shots for you. Another exciting day in my yard. Wait until it gets to be 110 degrees. I remember digging a "river" from your patio to the little house and our Barbie's would cruise along.